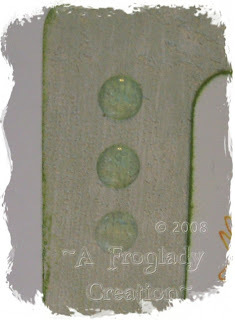 For this card I used white and green cardstock from the Paper Place, edged all with Landscape Palette ink and then decided I liked this textured piece of wallpaper I had found in one of my boxes so I replaced one of my green paper layers. 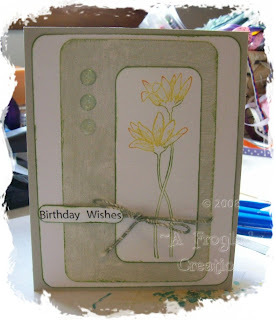 The floral stamp is from Innovative Stamp Creations and the sentiment is from TAC Good Life. I used Palette inks on the flower in Sunflower, Orangerie and Landscape. The sentiment is stamped with VersaFine Onyx Black, then cut out with my SU punch and adhered with red line tape to the fiber I tied around it. I didn't want to put something harsh on for the 3 "spots" at the top so I added Rain Dots Sorbet Villa - I love those things and need some more as mine are almost gone LOL! Anyone have some to send me?!?!?!?! This was a swap card and I really liked how it turned out - I hope the recipient likes it as much. Very pretty Karyn! Wish I was getting it!